There seem to be a lot of different types of juicer and it can be confusing to try and tell them apart. Even more confusing when you’re trying to figure out which one you need! Well luckily there are only 4 different types of juicer, and probably on 2 you actually need to know about masticating and centrifugal juicers. The other two are twin gear juicers and citrus presses, I’m going to talk a bit about all four explain the differences you need to know and talk about which type is best for which type of person. Or use the contents table below to jump to the one you want to know more about. You might be wondering what about slow juicers? Or cold press juicers? Don’t they get a say? Well, Those are both different names for masticating juicers. Because masticating juicers work slowly which stops the juice heating up while it juices, leaving you with a slow cold press masticating juicer, but that doesn’t roll off the tongue very well so let’s just stick with masticating juicer. And know that if you ever see one of the other names this is in fact what they’re talking about. I’m sure you don’t want me geeking out about all the tiny details and every single part of the machine so I’ll try to keep it under control but I’m not promising! 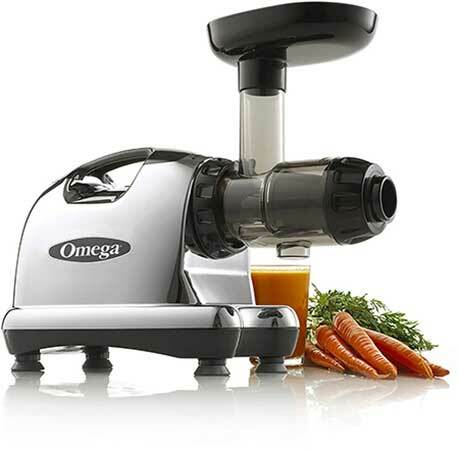 Basically, masticating juicers work by having a big single auger (which is sort of like a big drill bit) that rotates and squashes the fruit and veg you put in. It just sort of chews up what you put in which is why it’s called a masticating juicer, masticating means chewing. So it chews up what you put in and lets the juice run out one chute while the pulp runs out another. And as I said it works slowly, usually around 80 rpm which stops the juice from getting heat up from fiction and gives you a really fresh glass of juice at the end. The major advantage to it running slow and cold is that the juice you make lasts much longer than it does from a centrifugal juicer. As long as you’re storing your juice right it can last up to 3 days after you make it which is really good going and saves time since you can bulk batch. Apart from that they tend to be more efficient so you get more juice from the fruit and veg you put in compared to a centrifugal one too. I really like masticating juicers so I struggle to find a downside to them, but the only downside really is that if you don’t properly prepare your ingredients beforehand by chopping them up it can jam. But that’s a lack of prep rather than a problem of the juicer, still I thought I should be nitpicky so I don’t just leave this section blank. Masticating juicers are perfect for anyone who’s looking for the all-round juicing experience, they’re ready to start juicing seriously and want to get the most they can from their juice. 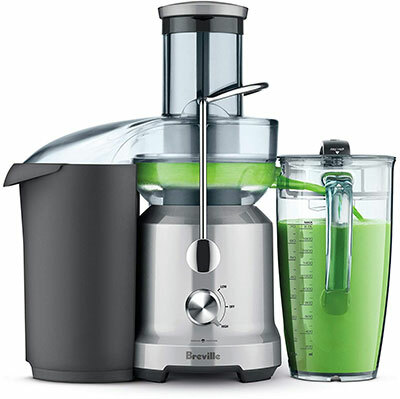 I’ve actually reviewed my favourite masticating juicers here for those interested. Centrifugal Juicers are a standard pick for a first juicer, they only have the one name and once you know how they work it’s pretty self-explanatory! Centrifugal juicers work with a fast spinning cutting blade at the centre, in fact, it’s a very fast spinning blade at anywhere from 3,000 rpm all the way to 10,000 rpm! So compared to Masticating juicers they are lightning fast. This blade spins around so the fruits and veg hit it and get pulverised and the centrifugal force then spins it off to the side where it hits a mesh that lets the juice pass through and catches the pulp. The juice then comes out one chute and the pulp out another. 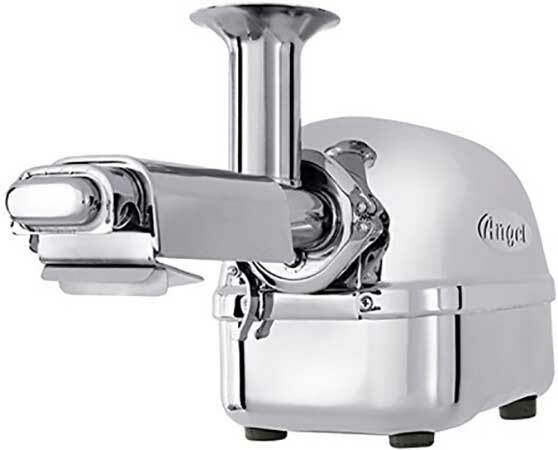 Centrifugal juicers are loved because they tend to be quite cheap, you get can get a decent one for around $100 but you get them as cheap as $30-$40 so if you’re on a budget they’re a great way to get started with juicing. Apart from that they, unfortunately, fall short of their Masticating counterparts! Basically everywhere a masticating juicer was great, centrifugal juicers aren’t so great, so they don’t make as much juice from the fruit you put in and the friction from the blade means the juice gets heated up while it’s being made which means it doesn’t last as long. If you’re on a budget then they’re a great choice, after all, you still put your fruit and veg in the top and juice comes out the bottom, which I know for a lot of people happens to be exactly what they’re looking for in a juicer. And if you’re just wanting to test the waters centrifugal juicers are a good way to go. 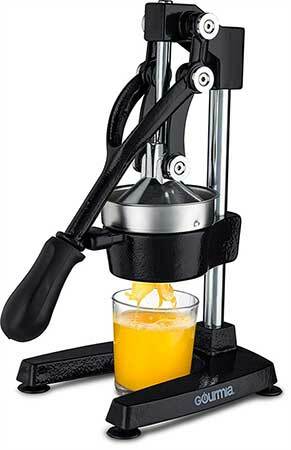 For a closer comparison of centrifugal vs masticating juicers check out this article. Twin Gear juicers are not for the faint-hearted, mostly because the price will leave your eyes watering if you’re not ready for it! Also for the article, I’m going to stick to calling these twin gear juicers because triturating is not fun nor easy to say. These are actually a type of masticating juicer but they kind of come into a league of their own. They work with not one, but two augers! Makes sense right? These gears smush together the ingredients and squeeze every last drop of juice out of them. They’re great because they are the best at what they do, they produce the most juice, work quietly and just do a damn efficient job at making juice. If you’re looking for the absolute best of the best then you’re definitely going to want to get a twin gear juicer. Plain and simple, some twin gear juicers can set you back over $1000 dollars so they’re definitely not right for everyone, and not very often a first juice. More than likely you’ve been juicing for a while and need an upgrade if you’re thinking about buying a twin gear juicer. Serious juicers, people who have juice at least once a day and want to make the most efficient juice possible. If you want this you’re not just trying out juicing or thinking about taking your health seriously you know you are. Not Your standard type of juicer but I thought them worth mentioning all the same. Citrus presses are really easy, they’re designed only for citrus fruits (as I’m sure you gathered) and they work by pressing down on a cut in half orange that squeezes all the juice out against a strainer. But what’s cool is you actually get electric ones, all you do with them is you put the half cut citrus fruit on the point of the juicer and press down a handle. The point then starts to spin getting every last bit of juice out. Really easy to use and super efficient if you want citrus fruit juice (I’m guessing you’re probably after orange juice) they’re usually very easy to clean and if you get a manual one not nearly as expensive as an electric juicer. Simply because you can only do citrus fruit on them, that doesn’t leave a lot of room for wanting any other type of juice, and if you do you’re going to have to buy another appliance to do it. I’m sure you can work it out… People who want orange juice! Or grapefruit juice, lemon juice, or lime juice of course. If that’s not what you want then this absolutely is not the juicer for you. If you do want one however then you should read my recommendations of the top choices here.